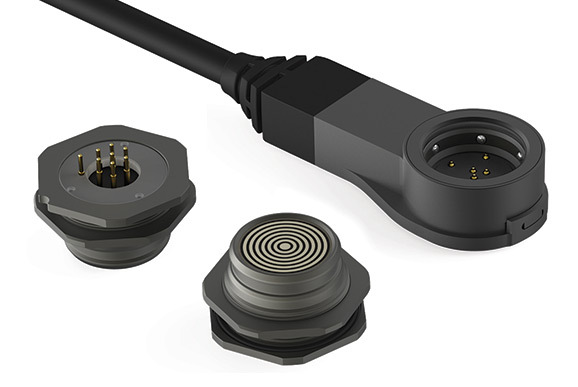 The Fischer LP360TM connector offers a unique and breakthrough plug & use technology able to fulfill urgent needs for connectivity solutions that are easy to mate, easy to clean for end users, and easy to integrate for design engineers. Fischer Connectors continues to push the boundaries of technological innovation that fulfills customers’ needs for connectivity miniaturization, high-speed data transmission, sealing and ruggedness. Now, with its brand-new product line the Fischer FreedomTM Series and Fischer LP360TM connector, it meets the needs for interconnect usability and integrability in portable and wearable devices, and, by extension, in the Internet of Things (IoT). The importance of connectors and their cabling to the functioning of electrical devices is critical. Should a single connector malfunction, the equipment and electronic system breaks down. It is vital, therefore, to provide design engineers with high-end, high-performance and highly engineered connectivity solutions in order to meet their urgent needs for easy and smart integration. In that sense, the connectivity industry is instrumental to driving innovation in the electronics world in general, and for the defense & security industry in particular, within its Dismounted Soldier Systems and Future Soldiers programs. In networked wearables sharing a common power and data bus, connectivity is a key innovation driver, helping to make devices smaller, lighter and smarter while maintaining or enhancing their performance. In the Defense & Security environment, the innovations provided by the Fischer LP360TM connector enable design engineers and integrators to easily integrate connectors and cabling into the portable devices and those body-worn by soldiers in their armor and tactical vest, such as: cameras, weapons sights, switches/hubs, night vision goggles, radio and radio microphones embedded in helmets, sensors, light, GPS, and batteries hidden under armor to charge nanodrones designed to silently reconnoitre enemy positions. The Dismounted Soldier Systems and Future Soldier programs have been working for years to make the soldier “connected”. Sharing information in real time about the area he is operating in will make him more effective and bring faster and safer mission execution. The Fischer FreedomTM Series fulfills two urgent needs: 1) optimized cable management, 2) shared data & power bus. The Fischer LP360TM connector eliminates the key code, meaning it can be plugged and routed in any direction, ensuring that the cable on the vest can always go straight to the device. No more twists and turns means shorter cables in the kitted equipment. This also eliminates tangles, reduces clutter and increases usability, making equipment lighter and faster to set up. As the Fischer LP360TM has no key code, it offers 3600 mating “freedom”, meaning it can be plugged and routed in any direction, ensuring that the cable can always go straight to the device. No more twists and turns means shorter cables in the equipment body-worn by dismounted soldiers, healthcare professionals or patients, civil engineers, surveyors and operators, and law enforcement officers and security guards. 1. Easy mating. Mating the lightweight and compact LP360TM connector becomes as easy and intuitive as buttoning up a vest – without compromising on the high-performance reliability required in harsh military environments. 2. Easy cleaning. The connector is fully cleanable (both plug and receptacle), and is easy to use and maintain, with a faster set up and improved durability. Integrability is the capability and versatility that Fischer Connectors’ direct customers, design engineers, need in order to easily and seamlessly integrate connectors – with or without cables (as explained below) – into the multifunctional devices that are part of the modern soldier’s armor and tactical vest. 3. Easy integration. Thanks to its compact and low-profile design – which is also MOLLE compatible – the LP360TM connector is easy to integrate into clothing with devices and subsystems; via the panel-mounted plug interface, cables can even be removed completely, and the connector can be directly integrated into the housing of the device, for example a camera or a sensor. “Our core mission at Fischer Connectors is to make our customers’ lives easier with a collaborative approach and tailored connectivity solutions,“ says Jonathan Brossard, Fischer Connectors Group’s CEO. “The creation of the Fischer FreedomTM Series is evidence that our mission actually strengthens our customers’ abilities to design for their markets. Reimagining connectivity like we’ve shown in the new Fischer FreedomTM Series allows those customers to turn their ambitious ideas into solutions that fit their world and help them break into new markets as well.